Grey Go-away-bird’s English name comes from the typical calls of this beautiful bird. Adult male is entirely soft smoky-grey. On the upperparts, flight feathers and primary coverts are darker grey. Grey tail becomes darker towards the dark brown tip. On the underparts, chin and throat are darker than belly, whereas the breast is slightly washed greyish-olive. On the head, plumage is pale grey, paler around the eyes. Crown shows a wonderful slightly shaggy crest of about 6 to 7 cm in length. This crest is as raised or flattened, according to the moment. Strong, short, decurved bill is black. Eyes are dark brown. Legs and feet are black. Juvenile has buffer plumage than adults, and shorter crest. Grey Go-away-bird has noisy, typical nasal call “g’wa-ay, g’wa-ay” descending in pitch, but with the second note more accentuated. These calls are typical of acacia savannahs in Africa. This bird utters series of plaintive notes, giving it the English name. 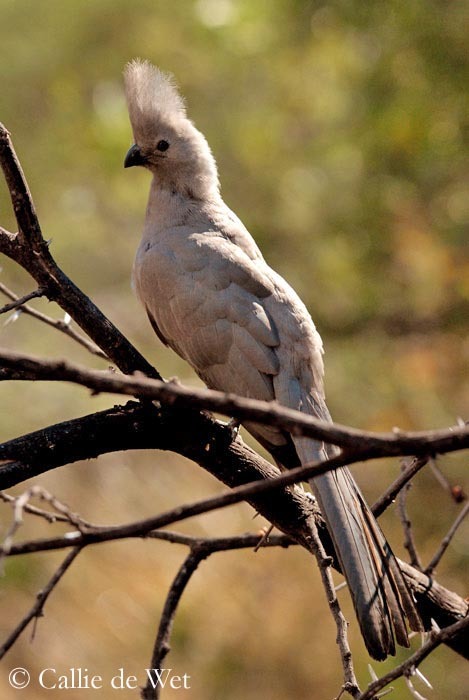 Grey Go-away-bird frequents mainly acacia country, thorny savannahs and nearby woodlands including acacias. This species is often seen in suburban areas such as parks and gardens. It highly depends on water. It can be seen from sea-level up to 1500 metres of elevation, sometimes more. 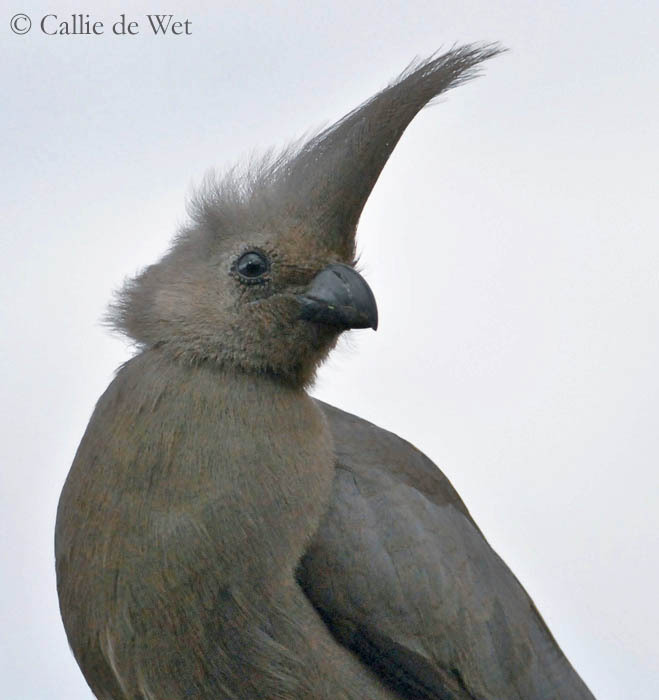 Grey Go-away-bird lives in South Africa. Grey Go-away-bird is gregarious and moves in groups of up to 20 birds very busy and hopping into trees. It is fond of fruits, such as wild figs and berries. But it also consumes buds, leaves and flowers, invertebrates and snails. It forages sometimes in gardens for vegetables. It can probes flowers for nectar. It also takes emergent termites on the ground, and hawks in the air varied insects. It forages for fallen fruits on the ground, and in lower parts of the bushes. Grey Go-away-bird is considered as pest in orchards and plantations where it damages the crops. This bird needs to drink regularly, and flocks of up to 30 birds gather at water sources. 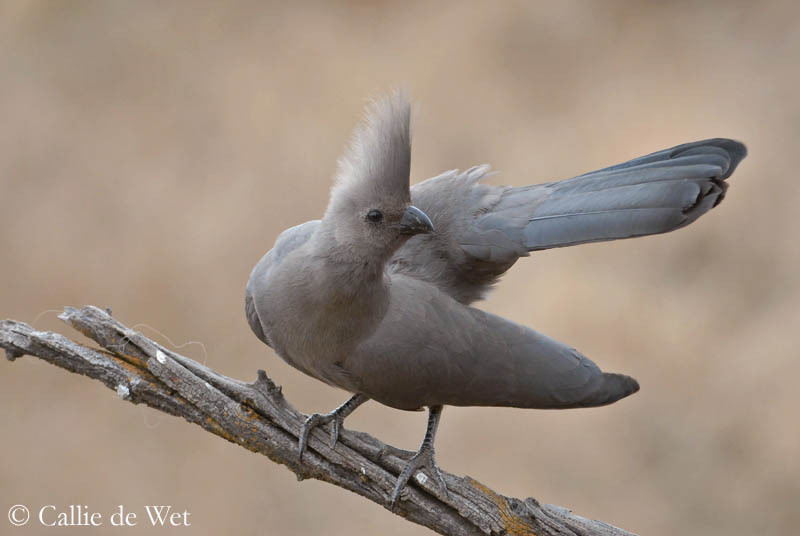 During the breeding season which starts with the rains, Grey Go-away-bird is noisier with much calling. We can observe chasing from tree to tree and mutual feeding. Displays are performed with bill open and closed, crest raised or flattened, bowing head and flicking tail. 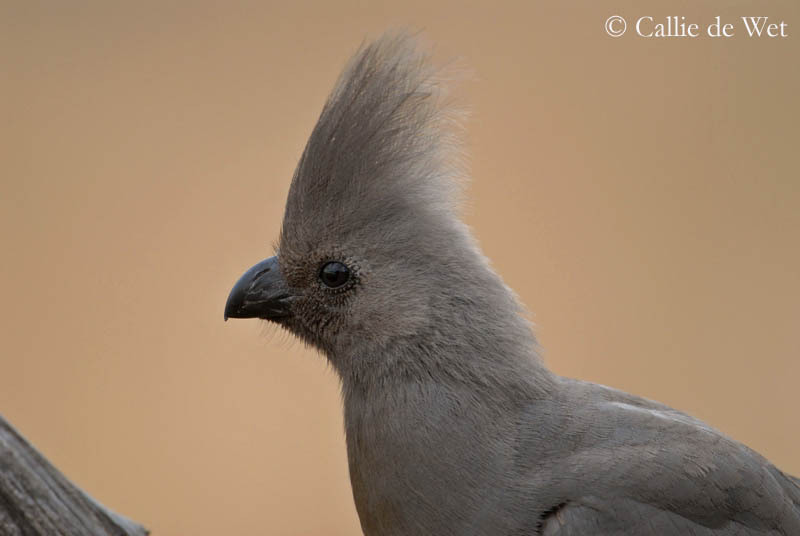 Grey Go-away-bird is resident in its range, but it makes seasonal local movements, according to the food and water resources in southern Africa. Grey Go-away-bird takes off fairly readily and it is able to fly long distances with relatively strong and buoyant flight. 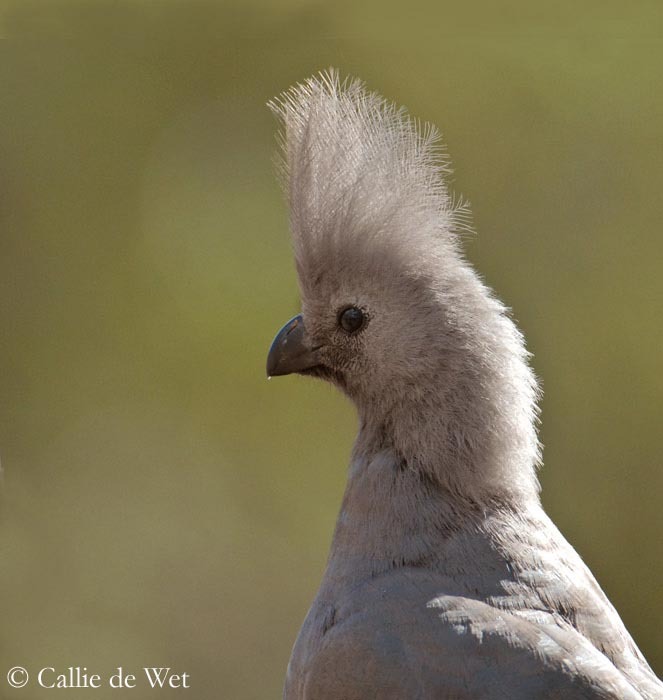 Breeding season varies according to the locality, but in South Africa and Zimbabwe, Grey Go-away-bird breeds all months of the year. 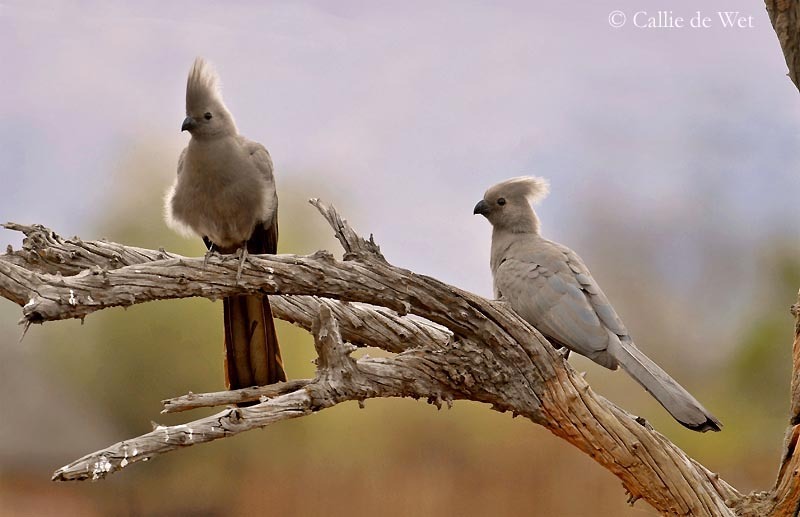 Grey Go-away-bird usually nests in acacia or thorny trees, but sometimes in other species. Nest is a loose platform made with sticks and twigs of about 20 to 24 cm in diameter, situated at 3 to 20 metres above the ground. Both sexes build the nest, often hidden among dense foliage but not necessarily. Female lays 1 to 4 eggs, usually 3, white or pale blue, and slightly glossy. Incubation lasts about 26 to 28 days, shared by both adults. Female broods at night. Chicks are covered in dense brownish down. Both parents feed them by regurgitation. When young are 2 to 3 weeks old, they are able to clamber around the nest into branches. They leave the nest 23 days after hatching, and they can fly at one month. Parents still feed them for 40 to 45 days, and young become independent at 7 weeks of age. Grey Go-away-bird feeds mainly on fruits of several plant species, and also cultivated fruits. It consumes the pods of acacia, and probes flowers for nectar or eats flowers, buds and leaves. It also takes emergent termites on the ground. Grey-Go-away-bird is common in most parts of its range and this species is not globally threatened. However, it is a pest for orchards and gardens, and it is often persecuted. It is also killed for food in great numbers. Hunters don’t like it because it seems to warn wild game birds and animals by its loud calls. In addition, Grey Go-away-bird is preyed upon by raptors such as Bateleur and African Goshawk, and other birds of prey.